For decades PC gamers have been content to let the colored lights of their favorite virtual playgrounds remain safely contained within the borders of their monitors. Mad Catz's amBX-powered Cyborg PC Gaming Lights present a compelling reason to start playing outside the box. I've been writing about amBX for years now, and my articles on the subject have often been delivered with a degree of mocking cynicism. Originally developed as a research project at Phillips, amBX is a technology that utilizes colored LED lighting and other effects (including wind-blowing fans) in order to create a deeper, more satisfying sensory experience for consumers of movies, music, and video games. It seemed silly to me. My monitor and television set contain all the special effects I need. The entire concept comes across as a ploy to dazzle people with flashing lights in order to separate them from their hard-earned cash. It's a ploy that works. The $99 Cyborg PC Gaming Light bundle from Mad Catz is a package containing a pair of circular LED lamps with adjustable bases that connect to your PC via its USB ports. Each light requires its own USB cable and power adapter, further taxing my dangerously crowded power strip and making me wish I remember where I misplaced the twenty different USB hubs I've purchased over the years. The light can be positioned wherever one pleases; since all of the product shots depict them facing the wall to either side of the computer monitor, I opted for that configuration. It did involve removing the unicorn and teddy bear pictures I had hanging over my desk, but these are the sacrifices one must make to be a games journalist. It bears noting that two isn't the limit for these little glowing circles. If one possessed the means (and a substantial number of convenient power outlets) they could surround themselves with Cyborg PC Gaming Lights, creating a room-encompassing light show on par with the best seedy live music venue. After I had the two units connected I installed the configuration software, loaded up World of Warcraft, and a pair of disappointingly small splashes of colored light appeared on either side of my display. That's what I get for introducing dynamic lighting effects at noon on a sunny day in a well-lit apartment. Once night fell the wall behind my monitor was awash with gorgeous color. As I wandered through World of Warcraft's new Firelands zone, the dull off-white plaster of my apartment wall was bathed in a fiery light. Capable of displaying 16 million colors, the Cyborg lights subtly shifted with the scenery. Staring down at the ground caused my monitor's newfound halo to darken, emitting a light that matched the deep brown of the earth below my feet. Shifting to first-person view and casting an elaborate spell set the illumination dancing in a way that the teenage acid-experimentation period version of me only dreamed of. In games that specifically support amBX technology the effect is even more profound. In Brothers in Arms: Hell's Highway the light glows red to indicate the players is out of cover and in danger of being killed. In Clive Barker's Jericho the lighting acts to accentuate each muzzle flash and explosion, making my computer room look more like a war zone than it already does. 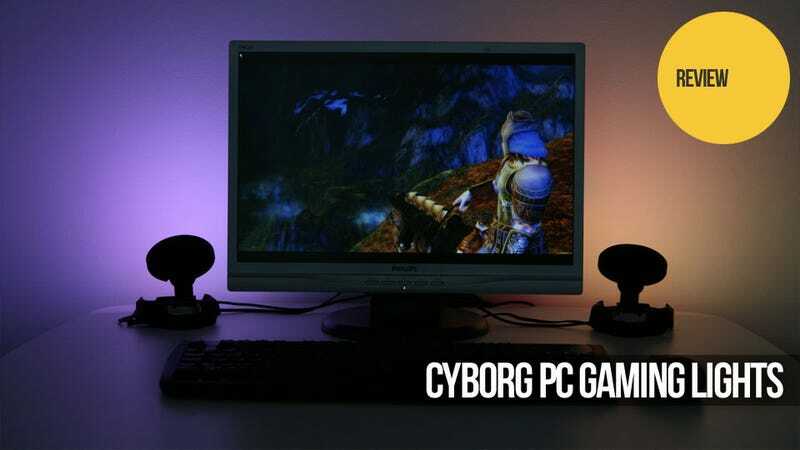 Beyond gaming, the Cyborg PC Gaming Lights also work with a wide variety of media players, adding a little extra light to movies, television shows, and music. I watched a bit of Tron Legacy with the devices enabled and shat glowing blue lights for three days. The effect is particularly striking when used in conjunction with the iTunes music visualizer, though not while playing Fallout Boy. One can even set up a Windows profile that assigns lighting effects to commonly performed tasks. For example, every time I click the Windows start button a wave of blue light splashes from left to right behind my display. Why? I have no idea, but it pleases me to no end. I suppose the main question one has to ask with a device like the Cyborg PC Gaming Lights is am I more engaged and immersed due to the application of colored light extending the picture beyond the confines of my computer monitor? I honestly couldn't say. The overall effect is pleasing, but my life wasn't significantly changed. I didn't suddenly start growling like a Worgen. Clive Barker's Jericho wasn't suddenly a masterpiece of game design. Fallout Boy didn't spontaneously erupt into something more tolerable, like water boarding. What I can say is that I missed it when it was gone. What I can say is that I missed it when it was gone. Booting up a fresh game and not automatically being greeted by the reassuring glow of these versatile little LED lamps was a true letdown. Though there is a large number of games supported out of the box some, like DC Universe Online or Alice: Madness Returns , left the wall behind my monitor dull, dark, and lifeless. A quick hop into the configuration software to check the "enable amBX" box next to the game name solved the issue, but that initial period of deep disappointment was telling indeed. My exact words when Mad Catz's Cyborg PC Gaming Lights arrived at my house were, "Oh good, the stupid gaming lights are here." Now I've realized that my ill-will towards amBX wasn't so much directed at the technology itself, but rather the idea of dropping modest amounts of money for the sole purpose of adding ambiance to your gaming environment. I'm a utilitarian PC gamer; as long as I have a monitor, a mouse, a keyboard, and some sort of sound-making apparatus, I'm perfectly content. After spending a couple weeks gaming by the glow of the Cyborg PC Gaming Lights, I've decided that perhaps there was room for a little more atmosphere in my gaming space. It's the sort of product you don't know you want until you have it, and once you have it you don't want to let it go. Consider me illuminated. Find out where to buy the Cyborg PC Gaming Lights at Cyborg's official website. Suggested retail price $99. Note that the flickering in this video doesn't occur in real life. Using VLC Media Player set to Direct3D rendering mode made Tron Legacy vomit all over my wall. Yum!